I first saw Chris Petit's debut feature Radio On back in 1980 on its original release. It was to be twenty-eight years before I watched it a second time. Last Monday, to be exact. After such a gap I was inevitably unable to recall much of the film's detail, but certain elements remained surprisingly vivid in memory. And you know what? They still looked and sounded exactly as I remember them. Something about the film had clearly made an impression. Coming back to it was like re-acquainting myself with the friend I met only briefly but whose company I enjoyed and whose personality and style I admired. I just can't work out why it took us so long to meet up again. Vivid Recollection #1: The Opening Shot. To the strains of David Bowie's Heroes/Helden (a half English, half German version of the song, perhaps a coded announcement that this is an Anglo-German co-production), the camera drifts around the rooms of a Bristol flat, lingering on a pinned-up quote and the night-time window view, and coming to rest on the out-of-bath legs of a man we only glimpsed earlier and assume is dead. I never quite understood how that was communicated so well – after all, he could be asleep or lost in thought, but I just knew from that first brief appearance that he was no longer in the land of the living. It's an intriguing mood and plot-setting sequence and a compelling marriage of sound and imagery. Mind you, set just about any image to Heroes and it's going to look good, but something is so right about this opening that I won't hear a word said against it, even by me. The body in the bath belongs to the brother of the film's lead character Robert (played by David Beames in a performance that comes close to redefining the term low-key, but in a manner that is appropriate for the tone of the film), a London-based factory DJ who elects to drive to Bristol and investigate the death for himself. Vivid Recollection #2: The Architecture. It's funny how even familiar locations can seem alien if observed though another's eyes. In Radio On the architecture of London and the roads that lead from it are transformed by Martin Schäfer's almost time-locked monochrome cinematography into a gloomy but bleakly attractive industrial landscape. Didn't I mention the film was in black-and-white? 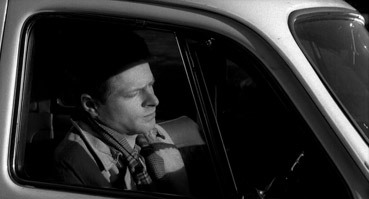 This provides an inevitable and doubtless intentional link to the road movies of Wim Wenders, the film's associate producer, and looks forward to the on-the-road character glumness of Kaurismäki's Take Care of Your Scarf, Tatyana. Vivid Recollection #3: The Music. Heroes is just the start of it. Music is Robert's almost constant companion on the first leg of his journey and it's a mix tape to die for, or least was for myself and my friends at the time. But unlike a legion of films today, whose rock soundtracks are shaped as much by the funding deal as the filmmaker's musical smarts, every track here feels organic to the location and the on-screen imagery. 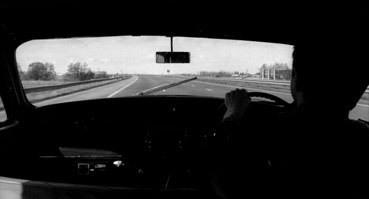 Wreckless Eric's While Wide World plays on a bar juke box, Devo's Satisfaction takes us through the mechanics of a car wash, and Kraftwerk's Radioactivity accompanies an extended but strangely mesmerising through-the-windscreen motorway shot. Vivid Recollection #4: The Garage Mechanic. Yes, that's Sting as the Eddie Cochran-obsessed mechanic crooning Three Steps to Heaven in a scene that still entrances for its effortless naturalism. 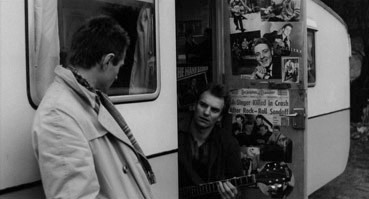 And remember, this is Sting shortly after his Quadrophenia acting debut and just before The Police went global. Robert's arrival in Bristol is not destined to provide him or us with concrete answers or involve him in anything approaching a real investigation, and it becomes clear that the death itself is merely a MacGuffin to get him on the road. His time in Bristol involves him in further encounters, with the woman who owns his brother's flat, with a wide-eyed kid at a hot-dog stand, and with a German girl (Wenders regular Lisa Kreuzer) who is searching for her missing daughter. None of them are able to offer Robert any sense of resolution or contentment. Vivid Recollection #5: The Girl and the Pool Table. Robert's quiet implosion reaches a peak in a bar when he accidentally disrupts a game of pool and has his stool kicked from under him by a pissed-off local girl. Back in 1980 I was frustrated by this, perhaps because I'd formed enough of a bond with our dour lead to want him to kick back against this injustice. It was a time in my life when I had still to shake off the constraints of formula. Years later the moment works so well precisely because he is unable to react, too emotionally drained to even return to his feet at a dignified speed, and then only able to muster the effort to slowly shuffle from the room, lost in his own grief. Vivid Recollection #6: The Ending. No, I'm not going to reveal it here, but even by the halfway mark few will be expecting a last-minute twist or revelation or even a formal conclusion. What we get is a transition, one I'll leave you to make your own suppositions about, and like so much else in the film its nature is suggested less by the on-screen action than the music that accompanies it, Kraftwerk's Ohm Sweet Ohm. It's a tune whose gradually increasing tempo and upbeat melody creates both a sense of continuation and the feeling that we are at the start of a new, unspecified journey, one with more that a flicker of hope for better things. Getting its first ever UK DVD release, the anamorphic 1.85:1 transfer here is good but a few notches short of great. The contrast is generally fine and the black levels often excellent, particularly in night-set scenes, while the monochrome greys are sometimes rather lovely. The source print, however, is not in perfect shape, with some busy dust spots at times and even a few very noticeable scratches, although there are only two occasions towards the end where these really make themselves known. There is also a little left-hand light leakage and one point and the odd bit of picture flicker. Detail is good throughout. The Dolby 2.0 mono soundtrack is may lack the sort of all-inclusive spread and musical punch that 5.1 can offer, but it still scores on clarity and has a most reasonable dynamic range. Very occasionally there is a slight hint of distortion, but it's rare. There's also an option on the soundtrack setup that allows you to select scenes by the music track that drives them. English subtitles are provided for the hearing impaired. An illuminating pair of intercut interviews with the film's director and producer, who provide pretty much all of the hoped-for background detail on the production from inspiration to completion. The genesis of the film is of particular interest, and it's nice to know that a low budget production could secure such a great soundtrack, not through tie-in deals but by directly approaching the artists and asking their permission. There are some engaging recollections and stories here, my favourite involving Petit's first meeting with Kraftwerk and a misinterpretation of the film's title. Pleasingly this extra also has subtitles for the hearing impaired. Made in 1998 for Harlech Television, apparently to mark an unspecified anniversary of the release of Radio On (we can assume 20, although release dates suggest we are a year early here), this avant-garde short blends footage from the original film with production stills and newly shot Hi-8 footage at the same locations. It explores the film itself, its making and the changing times in almost cubist fashion, fragmenting the structure and soundtrack to sometimes hypnotic effect, although I'll confess to being less fond of the textual elements, something that for me always shatters the abstract spell in such works. It also provides a useful introduction to the more experimental style of Petit's more recent films. Not an easy sell, and I'm not sure the trailer rises to the challenge. A small but packed booklet containing a detailed synopsis, essays exploring the film's qualities by Jason Wood, Rudy Wurlitzer, Geoffrey Lowell-Smith, Sukhdev Sandhu and John Patterson, a celebration of the soundtrack by Ian Penman, a biography of Chris Petit by Julian Petley, a biography of Keith Griffiths by Michael Brooke, and a look back at the film by Chris Petit. It's always a thrill to return to a film you've not seen for years and find that it's everything you remember it to be. 28 years after its first release, Radio On is still one of a kind and in that respect has not really dated at all, a visually arresting work with a killer soundtrack that reflects a time and place rather than being consigned to it. I'm willing to live with the relatively minor print imperfections for the other things this BFI disc gets right, and after years of unavailability it's just great to be able to experience the film again. Recommended.